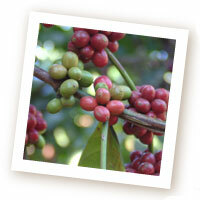 For Highland Coffees creating the most flavorful cup of coffee begins at the coffee’s origin. The coffee tree is a tropical evergreen with broad, shiny, arrowhead-shaped leaves and tiny, fragrant, jasmine-like flowers. The tree produces a small deep red berry called a coffee cherry. It takes about five years after planting for a tree to yield harvestable cherries, and then the amount of cherries produced each year is only enough to make one to two pounds of roasted coffee. The best harvesting is done with selective picking in which only ripe cherries are taken from the branch. Beneath the layers of skin and pulp of the fruit are the seeds, which become coffee beans. After many stages of careful processing — usually involving de-pulping, fermentation, washing, drying, and sorting — the green coffee seeds or beans are ultimately packed in burlap sacks and transported from countries of origin to destinations around the world. Once they arrive, the beans are roasted and then sold to customers in the shop to take home, packaged up and sent to our online customers, or used to create the myriad types of wonderful coffee drinks we all love. Grown mostly on small- to medium-sized farms, coffee comes only from regions around the globe situated near the equator between the Tropic of Cancer and the Tropic of Capricorn. Some of the best coffee comes from East Africa and Arabia, Indonesia, Central and South America, the Caribbean Islands, and Hawaii. There are two commercially produced coffee species — Arabica and Robusta. Robustas are hearty growers, but they are harsh in taste. They are found primarily in mass produced brands lining grocery store shelves. Arabica is the species with all of the flavor — the subtleties, the complexity, the depth of character. Even among arabicas, however, there is a wide range of quality. Highland Coffees brings in only the finest arabicas. The birthplace of coffee is believed to be Ethiopia, where some of the world’s most exquisite coffees still grow today. 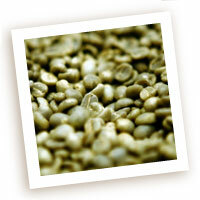 Some believe that coffee gets its name from the Kaffa (or Kefa) Province in Southwest Ethiopia. Coffee was first cultivated across the Red Sea in Yemen over a thousand years ago, and very distinct coffees still grow there. Kenya, Tanzania, and other countries in East Africa also produce outstanding coffee, although commercial cultivation started in these areas only in the early 1900s. The Dutch brought coffee cultivation to Indonesia in the 1600s. Today, the Indonesian islands of Sumatra, Java, and Sulawesi, along with neighboring Papua New Guinea, produce excellent coffee. The Caribbean island of Martinique was the site of the first coffee grown in the Americas. A French naval officer brought it there in the early 1700s. Today, fine coffees are grown throughout much of Central and South America. Brazil and Colombia are the world’s biggest producers, but great coffee is also grown in other nearby countries, including Costa Rica, Guatemala, Nicaragua, Panama, Mexico, and El Salvador. The only coffees grown in the United States come from Hawaii. Coffee was introduced there in the early 1800s. Arabicas are grown at high elevations, the best ones coming from between 3,000 and 6,000 feet. At high altitudes the cherries mature more slowly, developing denser beans with more concentrated flavors. They thrive in fertile, especially volcanic, well-drained soil, with warm days and cool nights. A canopy of shade trees creating diffused light is also beneficial. Whatever the location, the microclimate of each area within a growing region, along with the tree varietal and the care taken in processing, help give every fine coffee its unique flavor. Borrowed from the world of wine-making, the word terroir is often used to describe the sum total of all of the qualities of the land and climate of a particular growing area that come together to help create the one-of-a-kind flavor profile of each coffee. Highland Coffees seeks out coffees grown sustainably. Sustainable coffees are grown using farming methods that protect the environment as well as the farmers, their families, and those communities centered on coffee growing. Sustainable coffees must also bring farmers a profit, which allows them to continue to support their families and to reinvest in their farms so that they are able to continue to grow quality coffee in the future. Our coffee selection includes those that are organic, fair trade, and shade grown. The world’s finest coffees, therefore, not only taste great but also help protect the earth and create positive lives for all of the people who make this magical beverage possible.